Yesterday, I listed 25 questions you should be able to answer about your hero before you start them on their journey. But it all boils down to the biggest question of them all: Why him? Why her? Why is this person the hero of your story? Because they’re the best? Because they’re the most interesting? Because they have the most unique point of view? Do you even know? What you must know is this: You’re going to have a very hard time getting your audience to care about a hero unless they’re more extraordinary than their surroundings. But this brings up another important question: what about all those people who don’t make it into the superlative section of the yearbook? Don’t they deserve to have their stories told? Why aren’t we allowed to write about them? Yes, they deserve to have their stories told, too. But you have to understand that it makes the writer’s job a whole lot harder. Audiences are hard-wired to care about extraordinary, proactive people who try to solve their problems in unique ways. And they’re hard-wired not to care about ordinary, passive people who succumb to their problems in generic ways. (You know: people like you and me). Are you good enough to overcome those prejudices? 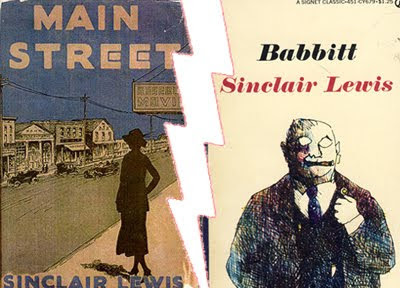 But after the massive popular and critical success of Main Street, Lewis wrote another great novel that was similar in tone, but wildly more ambitious. Babbitt is the story of George F. Babbitt, a typical small-city businessman mired in the petty pursuit of Chamber of Commerce boosterism. Unlike Carol, George is a chump. And there is no point-of-view character who might allow us to examine him from afar. There’s nobody else to root for. Lewis asks us to care about George, even though there’s no good answer to the big question: “Why him?”. After Main Street, Lewis knew he was good, and he set out to determine how good: could he make people care about a bland little man? The answer was a big yes—the book was another hit with the public and the critics, and the character is so well-remembered that his name has become a word in the dictionary. But…few people love George, or Babbitt, they same way that they love Carol and Main Street.